Round 4 of Calderdale League 1 took place on Monday this week and, after a disappointing showing in round 3, both Hebden Bridge ‘A’ and Hebden Bridge ‘B’ were hoping to demonstrate their powers of recovery. Pete Leonard’s Hebden Bridge ‘A’ team were put to the sword in brutal fashion by Huddersfield ‘A’ in their last match. Now, in a strange quirk of the fixture list this season, they were set to play their fourth consecutive home match of the season – they will in fact play six of their seven matches in the first half of the season at home. This schedule should give all the ‘A’ team members plenty of practice playing with the Black pieces before Christmas! On Monday night they were up against a resurgent Belgrave ‘A’ side who have bolstered their line up considerably this season with the inclusion of John Morgan and Dave Patrick. The visitors have also shown an impressively consistent line up so far this season using only six players to date. On Monday they brought Ian Hunter, Morgan, Patrick, Malcolm Corbett and Karim Khan to the Trades Club. Pete meanwhile had strengthened his team compared to the one he’d fielded for the Huddersfield defeat. Andy Bak returned to play on board 1 and Nick ‘Syko’ Sykes was back on board 5 after performing strongly on top board for the ‘B’ team in the last two rounds. As the two teams gathered for the match it was clear that the outcome was completely in the balance. On paper both sides had exactly the same average rating. Would the possession of the White pieces in these circumstances tip the balance in favour of the visitors? The match turned out to be just as tight as the statistics would have suggested. On board 2, though the Johns Morgan and Allan played out an interesting and intricate dance with John Allan relinquishing a pawn in exchange for active piece play, the game ultimately ended in a draw at the point when it seemed inevitable that Black would win the pawn back. On board 4, Neil Suttie seemed well set to open Hebden’s account as he got the better of Malcolm Corbett in the opening, winning first one, than a second pawn. However, in reaching out for a third he missed a tactic and had to relinquish a piece. The players reached an endgame in which Malcolm had a rook, bishop and two pawns against Neil’s rook and five pawns. The situation still looked dicey for White but Malcolm managed to stabiles the situation and, finally, they repeated moves and agreed a draw although the engine assesses the final position to be decisively in White’s favour with accurate play. Andy Bak lost out to Ian Hunter on board 1 but Hebden struck back decisively with wins on boards 3 and 5 to secure the narrowest possible victory. Pete Leonard’s win demonstrated most aptly the natural justice inherent in the game as, having succumbed to an opening trap in horrifying fashion last time out against Huddersfield, he this time sprung a trap of his own to secure a decisive advantage, winning a piece. That he was able to do this against a player as well prepared as Dave Patrick just goes to show that it really can happen to anyone! Meanwhile on board 5 the Syko was doing his dark work against one of his favourite customers, Karim Khan. Karim tends to play a hybrid Reti-Larsen’s opening system (with 1.Nf3 and 2.b3) when he thinks he’s facing a well booked-up opponent. The approach has worked for him in the past no doubt, but when you are up against someone as well versed in theory as Nick, playing offbeat lines can sometimes back fire. In this instance, even though he’d expected to face 1.e4, Nick wasn’t surprised by Karim’s opening choice and was able to gain a very comfortable position early on in the game as a result. The middle game developed along purely positional lines and Nick gradually improved his position and simply outplayed Karim who was eventually forced into desperate measures as he gave up a whole rook for just two pawns. The hoped-for initiative never manifested itself and Nick simply handed back an exchange and defused White’s activity to win the game and secure the match for Hebden. This excellent win put’s Hebden Bridge ‘A’ on three wins out of four. They are still most definitely in the title chase and will next play away at Golden Lion in Todmorden on the 13th of November. Now to Martin Syrett’s Hebden Bridge ‘B’ team who, despite putting up good resistance in all three of their matches before this one, had failed to score a match point. They too were playing at home on Monday night against fellow back-markers Brighouse. This match represented Hebden’s best opportunity yet to get off the mark. Brighouse brought pretty much their strongest line up of the season for a match that was vitally important for them too. On board 1 was Robert Broadbent, a player able to take on anyone in the league. Then came Nick Hudson, playing his first game of the season on board 2, Captain Paul Whitehouse on board 3 and Adrian Dawson and Tim Pryke on boards 4 and 5. To meet this team Martin fielded Andy Leatherbarrow, himself, Paul Gledhill, Neil Bamford and Terry Sullivan. With rating advantages on board 2, 3 and 5 and an evenly matched encounter in prospect on board 4, it looked like Hebden might have the edge. Of course rarely do all the games in a match go according to the ratings. Such was the way of things in this one as Andy Leatherbarrow succeeded in drawing with Black against Robert Broadbent on board 1 despite giving away more than 25 rating points. It was on the middle boards, where the games were most closely matched, that Hebden did their damage. Neil Bamford dispatched Adrian Dawson on board 4 and on board 3, new player Paul Gledhill took down Paul Whitehouse’s London System in confident fashion. He played sensibly until Paul misjudged a tactic that cost him a piece. The rest was pretty straight forward. Finally, Captain Syrett won a nice game on board 2. For once it was his turn to face a gambit line as Nick Hudson met his Sicilian Defence with the Smith-Morra Gambit. It’s not in Martin’s nature to play passively to hang on to material and so he didn’t as he prioritized development and placed his pieces on active squares. He also hung onto the gambit pawn with the only cost being that his king remained in the centre of the board uncastled for a pretty long time. 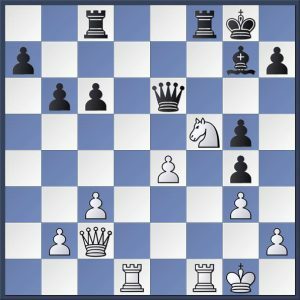 It turned out to be the safest place for it as Paul allowed Martin to exchange bishop for knight on g4 and opened the g-file by re-capturing with his g-pawn. Martin continued to prioritise piece activity until move 22 when he finally decided it was safe for him to castle king’s side. By this time he had a strong positional advantage as well as an extra pawn. Finally, it was Martin and not Nick who got an unstoppable king’s side attack as he pushed his pawns with his opponent pretty much a passive by-stander. At the end Martin broke through decisively with his queen to finish the game in his favour. This gave Hebden ‘B’ their first win of the season. 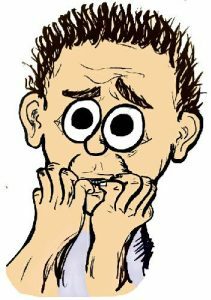 So, with both Hebden teams showing their ‘bouncebackability’ and keeping their respective hopes for the title and avoiding the drop alive, heads now turned to Halifax chess club where the other four teams in League 1 were gathered. Halifax ‘A’ took on Huddersfield ‘A’ and Halifax ‘B’ welcomed Golden Lion. Both visiting sides were the only ones left undefeated in the league at the start of the night and, by the end of the evening, they both still were. Huddersfield ‘A’ are perennial challenges for the title. In recent years though they have failed to get their strongest line up out consistently across the whole season. So far this time they have gotten stronger and stronger. Having defeated Hebden Bridge ‘A’ last time out now they were out to add Halifax ‘A’ to their list of victims and they fielded Greg Eagleton, Mitchell Burke and Dave Keddie together for the first time this season to help them do it. In fact, in the end it was made to look easy as Greg beat Bill Somerset, Mitchell beat Richard Porter and Dave beat Carlos Velosa. Dave Tooley then beat Sam Scurfield and Steve Westmoreland took down Mac Randhawa to record the League’s first whitewash of the season. Golden Lion meanwhile were given a head start as, for the second match in a row, their opponents defaulted a board to them. It could have been another overwhelming victory at the Lee Mount Club but in the end the visitors made hard work of it as they lost their first board of the season on board 5 where Marc Turu had a perfectly viable position against Ray Cully only to blunder to instant defeat. The visitors did manage to win the remaining three games but they certainly didn’t have everything their own way. On board 2 Phil Cook was forced to toil and grind late into the evening against Scott Gornall before he finally converted a rook and pawn ending where he had an extra pawn. On board 3, Andrew Clarkson defeated Howard Wood quickly but realized the outcome could have been different if Howard had spotted a tricky defence that could have netted him a piece. Finally, Dave Shapland won a piece very early in his game against Vivienne Webster but then played too casually and lost it back before going on to win the game for a second time in a tough knight, rook and pawns endgame when Vivienne got her knight trapped in enemy territory. The final score was 1 – 4. All of this means that Golden Lion stay on top of the league table by just half a board point over Huddersfield ‘A’. Both have 8 points. Hebden Bridge ‘A’ are in third place with 6 points, Belgrave ‘A’ have 4 and then Halifax ‘A’, Halifax ‘B’ and Hebden Bridge ‘B’ all have 2, while Brighouse stay rooted to the foot of the table and have yet to score. A number of games from this week’s fixtures can be found in the game viewer below. Thanks again to Nick Sykes for collecting and transcribing many of them for publication. Next week sees the start of the 2017-18 edition of the Calderdale Individual Chess Championship. As in recent years, all rounds will take place at the Trades Club on the first Monday of the months of November, December, January, February and March. John Kerrane is the tournament organiser. If you haven’t yet entered and you would like to please call (01422 842 426) or email (kerranerie@btinternet.com) John before the end of the day on Sunday 5th of November. All three Hebden Bridge teams crashed to defeat on a bad night at the Trades Club last Monday. Image used under Creative Commons terms and sourced from bleggg’s Flickr photo stream. On Monday last week all three Hebden Bridge teams took to their boards at the Trades Club as the ‘A’ and ‘B’ teams played their third round League 1 fixtures (against Huddersfield ‘A’ and Halifax ‘A’ respectively) and the ‘C’ team played their third round fixture against Halifax ‘D’ a week early. Hebden Bridge ‘A’ had started the season with a couple of wins and now faced stern opposition in the form of Huddersfield ‘A’ who had also started the season in perfect fashion. Usually, matches between Hebden and Huddersfield are super-tense and tight affairs but on this occasion Huddersfield rather cruised to victory by a margin that doesn’t really do justice to the close nature of the games. Sadly the tone was set by ‘A’ team captain Pete Leonard who fell into an opening trap against Dave Keddie and was compelled to resign in just 10 moves as he was a piece down with no compensation. At least he retained his perspective on the loss and remained sanguine. He has even annotated the game for us in the game viewer at the end of his post. We have indeed, all been there at some point. Your correspondent blundered a mate in one earlier this season. The night didn’t get much better. John Allan went down to Mitchell Burke on board 1. He seemed to have built himself a decent position and, according to the kibitzers, may even have overlooked some chances to press for victory. But in the end Mitchell found a way to win as he so often does from difficult positions. Sam Swain and Neil Suttie on boards 3 and 4 also went down against Steve Westmorland and Dave Tooley respectively. Sam never really managed to equalise against Steve’s English Opening and Neil suffered when he initiated sharp play by castling on the opposite wing to Dave but found that White’s attack was fastest. This just left Richard Bedford to salvage some pride for the home team by despatching Robert Sutcliffe with one of his trade mark off-beat opening lines, the Black Knight’s Tango. It’s a line ‘Beaky’ is an expert in and it showed as Robert struggled to get to grips with it and was defeated. Across the room Hebden Bridge ‘B’ did rather better but still came up short in a very close match with Halifax ‘A’ who had beeby Hebden ‘A’ in the previous round and by their own ‘B’ team in round 1. They desperately need to get off the mark and they did, but only just. Top board for the visitors was Bill Somerset and he took on Nick Sykes. This was a highly theoretical and classically set game in a Queen’s Gambit Declined. Nick equalised comfortably and the players agreed to halve the point fairly early in the game which was a great outcome for the home team as Bill is rated 30 points higher than Nick who secured a second draw against very strong opposition in two matches. There were also draws on board 3, 4 and 5 for Andy Leatherbarrow against Carlos Velosa, John Kerrane against Sam Scurfield and Neil Bamford against David Loughenbury. John and Neil also gave away serious rating differences and Andy and Carlos were rated almost exactly the same. This represented a great battling display by the ‘B’ team. But unfortunately their night was also due to end in disappointment as the last board to finish saw Richard Porter overcome Martin Syrett in a battle of the captains. Martin gained the exchange but afterwards his position seemed more difficult to play and eventually he felt compelled to give back a bishop to secure a dangerous passed pawn. Richard found a solution to the problems he had been set however and managed to convert his material advantage to a full point to seal Halifax’s first win of the season. Here’s an arresting position from the game between Robert Broadbent (Brighouse) and Phil Cook (Golden Lion). White has just played 39.Bh5+. Look at the fully-loaded fifth rank! The game ended in a draw and you can see it all in the game viewer at the end of this post. Elsewhere in League 1, Golden Lion continued their perfect start to the season by demolishing 4-man Brighouse ½ – 4½. The game of the night here was undoubtedly Robert Broadbent and Phil Cook’s draw which was a keenly contested encounter with Robert showing great determination and creativity to press hard for a win only to find that Phil was equal to the task as he just managed to hang on. It was one of those games that looked like White should win but in practice finding the solution was difficult and in the end, with his clock running down, Robert decided he should at least salvage a half-point for his team. The other three games in this match saw relatively straightforward victories for Andrew Clarkson against Paul Whitehouse, Dave Shapland against Adrian Dawson and new team member Marc Turu against Tim Pryke. Finally, Belgrave ‘A’ defeated Halifax ‘B’ to stay in contention for the title race. The damage was done here by Dave Patrick and Richard Bowman on board 2 and 3 as they saw off Scott Gornall and Howard Wood. The other games saw the Halifax ‘B’ players make very creditable draws against higher rated opponents to limit the margin of victory to 3½ – 1½. These results mean that Golden Lion and Huddersfield ‘A’ are now at the top of the league with 6 points. Hebden Bridge ‘A’ and Belgrave ‘A’ have 4, Halifax ‘A’ and Halifax ‘B’ have 2 and Brighouse and Hebden Bridge ‘B’ are still on 0. I mentioned at the beginning of the article that Hebden Bridge ‘C’ also played a match at the Trades Club. This was scheduled a week early to allow John Kerrane to organise the junior squad before going away on holiday this week. Halifax ‘D’ are, on paper, the team that the juniors should have in their sights as potential victims and indeed they did fair better than they had in their first two matches although they still went down in the end. The other two matches in League 2 were played on Monday this week and saw Belgrave ‘B’ defeat Belgrave ‘C’ by 3½ – 1½ and Huddersfield ‘B’ thrashed Halifax ‘C’ 4 – 1 with a result that sees them go top of the league on their own as the only side with a perfect record. They are followed by Belgrave ‘B’ and Belgrave ‘C’ who both have 4 points, Halifax ‘C’ and Halifax ‘D’ who both have 2 points, and, at the bottom, Hebden ‘D’ who have at least managed to win their first game of the season. Maybe that will inspire the youngsters to greater heights and more rewards for their efforts. You’ll find a good number of the games from last week in the game viewer below. Thanks to Nick Sykes for collecting and transcribing these for this report. White to play from Velosa vs. Swain (Hebden Bridge ‘A’ vs Halifax ‘A’) Black has grabbed a hot pawn. Can you see how White took advantage to press home the attack? Answer in the game viewer at the end of this post. 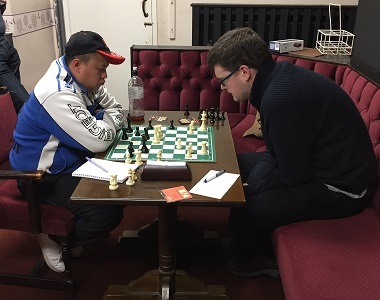 Both Calderdale Evening Chess Leagues have now played two rounds of fixtures, so we’ve plenty of action to catch up on in this post. Let’s catch up on round 2 of League 1 first of all. Most of the fixtures took place on Monday 2nd of October with Golden Lion’s first home fixture against Hebden Bridge ‘B’ postponed until Monday the 9th. Hebden Bridge ‘A’ took on Halifax ‘A’ at home in their second match of the season. In recent years these two sides have fought out some epic encounters full of twists and turns and almost always very tight indeed. Hebden had the better of things last season but for this fixture both sides sported line ups that looked very different to the corresponding fixture last season. Hebden Bridge ‘A’ had fielded Messrs Parsons, A.Bak, C.Bak, Shapland and Leonard on the 3rd of April when they edged a tight match 3 – 2. This time out the side was Andy Bak, John Allan, Sam Swain, Neil Suttie and Richard ‘Beaky’ Bedford. Team Captain Pete Leonard was away and stand-in Captain, Nick Sykes, elected to play his strongest five available players which meant no place for him in the line up. Halifax ‘A’ also had four different players to the April match. Last season they had Winston Williams, Darwin Ursal, John Morgan, Richard Porter and Sam Scurfield. This time out it was Bill Somerset, Richard Porter, Carlos Velosa, David Loughenbury and Barry Wadsworth. With this line up the visitors were out-graded on every board to a greater or lesser extent. On paper it looked it should have been easy for Hebden but it turned out to be anything but. On Board 1 Andy Bak and Bill Somerset continued their theoretical discussion of the Semi-Slav (this time the Anti-Moscow Variation as opposed to the Botvinnik Variation). This opening lends itself to mind boggling complications and generally both sides make inaccurate moves. On this occasion it was Andy with Black who came out on top. Board 2 saw Richard Porter play the London System against John Allan. John’s had plenty of practice of playing against this system from his recent games against Matthew Parsons and Richard didn’t play the most ambitious lines. Never the less the game did get pretty complicated. However, with plenty of life still in the position, the players agreed to a draw on move 25. Halifax struck back on board 3 where Carlos Velosa was up to his old tricks with Bird’s Opening (1.f4). Sam Swain handled the unorthodox opening system perfectly well but Carlos is a dangerous tactician and, when Sam grabbed a hot pawn on move 26, Carlos seized the opportunity and found a pretty forcing sequence (see the puzzle at the top of the post). Sam missed the point and resigned when he saw mate in two coming. Loughenbury versus Suttie on board 4 was another London System. Here too Black seemed to equalise fairly easily and the game simplified quickly to a double rook, knight and six pawns each endgame. The players decided as early as move 22 that the position was sterile and shook hands. Of course the engine has an opinion of its own and suggests White was better with potential to play against a vulnerable Black a-pawn. This meant that the match was decided on board 5 where Hebden had the largest rating advantage of any of the encounters. However, Richard Bedford had toiled with the Black pieces to take down Barry Wadsworth in round 2 of last year’s Calderdale Individual Championship so the conclusion was by no means forgone. On this occasion however, Beaky made lighter work of the task when, in the middle game he managed to create and exploit a pin on the d-file. Barry had a fleeting opportunity to release the pin on move 26 when Bc5 or Bd4 (see the game in the viewer at the end of this post) may have enabled him to hang on. But after the game move 26.Re3 and, soon after, the critical mistake 28.h4? he first lost a piece and then his queen with check mate to follow shortly. Thus did Hebden manage to win a tight match 3 – 2. Bizarrely they have been scheduled to play 6 out of the first 7 matches this season at home (!!) which means they are going to get some practice with the Black pieces and may be able to make a strong surge when the have the reverse fixtures after Christmas. On the same evening Belgrave ‘A’ bounced back from their opening fixture defeat against Golden Lion to thrash Brighouse ½ – 4½. The home side were without their top board Robert Broadbent and this exposed the rest of the squad. Only the Brighouse Captain, Paul Whitehouse, saved a walk over for the visitors when he held John Morgan to a draw on board 2 – a highly creditable outcome considering the rating difference of almost 60 points. Then, on Wednesday last week, Huddersfield ‘A’ took on Halifax ‘B’ who had surprisingly opened their account by beating their own ‘A’ team in the first fixture. Huddersfield defaulted their third board and Ray Cully held Steve Westmoreland to a draw on board 5 but the other three games went the way of the home side as Huddersfield won 3½ – 1½. To complete the second round of fixtures, Golden Lion and Hebden Bridge ‘B’ played their match this last Monday, the first at the eponymous venue of the home side. It must be said that not everything went perfectly smoothly (the venue was noisy) but the necessary steps have already been taken to ensure better conditions for future matches and five new visitors to the league turned up for some social chess which was very encouraging. The match itself swung the way of the home side all too quickly. On board two Hebden’s Andy Leatherbarrow blundered a piece early in the game and, although he battled on for some time after that, the outcome was never in doubt and Andrew Clarkson converted to the full point. By this time though the match was already in the bag. Dave Shapland beat Neil Bamford on board 3 in the first match to finish as Neil got his pieces into a tangle, gave up the exchange for a pawn to try and sort himself out only to drop a piece to a tactic shortly after. On board 4 the manner of victory was rather different as Golden Lion’s David Innes ground down Terry Sullivan finally swapping down to a king and pawn ending where he had an extra pawn and a sure win. Terry resigned rather than suffer further. Finally, on board 5, Golden Lion’s new recruit Peter Dickinson played a complicated draw out against Paul Gledhill. There was plenty of complexity and excitement in this one but in the end the players decided to agree peace terms with the situation at the board still rather unclear. With the match now decided Hebden’s Nick Sykes was able to offer a draw to Martyn Hamer in the confidence that he was at least no worse and possibly even slightly better against his much higher rated opponent. Certainly Martyn was happy enough to grant the request given that trying for anything more would have involved a good deal of risk and a very long and drawn out evening’s effort to boot. With all teams now having played two matches, Golden Lion top the table with 4 match points and 7½ board points. Hebden Bridge ‘A’ are in second place with the same match points and 7 board points and Huddersfield are in third, also with two wins from two matches but 6½ match points. Belgrave ‘A’ and Halifax ‘B’ have one win and one defeat to their names and at the bottom, Brighouse, Hebden Bridge ‘B’ and, surprisingly Halifax ‘A’, are yet to score any points. In round 3 next (matches played tonight) both Hebden Bridge teams will be at home with Hebden Bridge ‘A’ playing Huddersfield ‘A’ and Hebden Bridge ‘B’ hosting Halifax ‘A’. These should be fascinating match ups. Elsewhere Golden Lion host Brighouse and Belgrave ‘A’ will play Halifax ‘B’. John Kerrane’s (predominantly junior) Hebden Bridge ‘C’ team played their first round match on the 25th of September and their second round match last Monday. In round 1 they faced Belgrave’s new ‘C’ team outfit. Unfortunately, Hebden were missing one of their youngsters when Martha Leggett had to take an emergency trip to the dentist at the last minute. The largely junior line up was up against it any way as Belgrave fielded an experienced side who were more than a match for the hosts on this occasion. Then, last week, Hebden fielded a similar line-up against Belgrave’s ‘B’ team (this match was an away fixture but Belgrave had kindly agreed to play it at the Trades Club so that transportation for the juniors was not a difficulty. This time the juniors faced a side that in no small part reflected the line up of the Belgrave ‘A’ team that had participated in League 1 a few years ago. Once again Hebden managed just a single draw and this time it was provided by one of Todmorden’s refugees welcomed into the club to play in League 2 – J.P Ellis who scored a very fine draw with Gordon Farrar on board 1. All of this means that Hebden ‘C’ are still awaiting their first win of the season. Maybe it will be ‘third time lucky’ as they take on Halifax ‘D’ at the Trades Club this evening (this match is being played a week ahead of schedule). In League 2, Belgrave ‘C’ and Huddersfield ‘B’ top the table with two wins out of two. Halifax ‘C’ and Belgrave ‘B’ have one win each and Hebden and Halifax ‘D’ are yet to score. You’ll find a number of recent games in the game viewer below. Our thanks to Nick Sykes for collecting and transcribing the Hebden Bridge games. 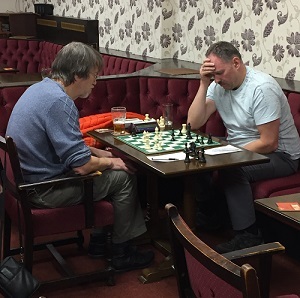 It’s been a while since our last post and much has action has taken place in the Calderdale Evening Chess League with Division 2 drawing to a close and Division 1 now in its final few rounds of fixtures. Let’s start by round up the Division 2 final standings as the last round of fixtures were played on the 27th of March. Halifax ‘C’ and Brighouse were the only two teams in contention for the title and the single promotion berth on offer this season (I believe this is correct as there are only 6 teams in league 2 this season). Halifax began the round 2 points clear of Brighouse and, with the two sides board scores being almost identical, that meant Brighouse needed to beat Hebden Bridge ‘C’ and hope that Halifax went down to Todmorden ‘C’ if they were to pick their pockets at the last. Brighouse did their job with a whitewash of the Hebden Bridge junior outift. Hebden Juniors Captain John Kerrane reports on the outstanding game of the night. The match was notable for a terrific, tense struggle between Brighouse captain Paul Whitehouse and Toby Dodd on board 3. In a blocked position, Whitehouse eventually forced a breakthrough on the kingside, but then found himself in a dangerous position. Eventually, he managed to avoid his opponent’s counter-play, until, with mate inevitable, Dodd was forced to resign. That unfortunately meant that the juniors finished the season with no match points and just 9 game points from their ten matches. Never the less, there are some very young players amongst their number and John is seeing a number of them developing with some promise. Let’s hope they will continue to improve and enjoy the game next season. Meanwhile, over at Todmorden, the home team were being subdued by a similarly emphatic score line by Halifax. On paper this match looked like it should have been a close one but Halifax steamrollered their way through some experienced opposition to win 5 – 0 and take the League 2 title. Congratulations to them! The final league table and all results can be found on the Calderdale Chess League website. Now to League 1. Readers may remember that, back at the beginning of March we reported on Todmorden ‘A’s significant step towards a third successive league title as they overwhelmed Hebden Bridge ‘A’ at home. Since then there have been two further rounds of fixtures with the penultimate set taking place this evening and the final round on April 23rd. These fixtures took place on March 20th and Todmorden ‘A’ underlined their superiority with another emphatic home victory against Huddersfield. Only Dave Gray on board 5 managed to hold his higher rated opponent Dave Patrick as Todmorden won the remaining games to win 4½ – ½. This put any fading hopes Huddersfield might have had of winning the league completely out of their heads and while Todmorden continued to power forwards their remaining rivals had contrasting fortunes as Hebden Bridge ‘A’ had to take a full default from Halifax ‘B’ who were unable to field a team, while Halifax ‘A’ were only able to draw with Belgrave ‘A’ at home. Three of the games in that match were drawn with Malcolm Corbett defeating Richard Porter for Belgrave whilst Carlos Velosa defeated Gordon Farrar for Halifax. This left Hebden Bridge ‘A’ still top on 16 points but they were only one point ahead of Todmorden ‘A’ who had a game in hand. Halifax were on 13 points and now had to face first Hebden Bridge ‘A’ and then Huddersfield and Todmorden ‘A’ to complete their season. They would need to win all three of those matches to have any chance of taking the title. Last week the 12th round of matches took place and this coincidentally put the top three teams into the same room as Hebden Bridge ‘A’ hosted Halifax ‘A’ and Hebden Bridge ‘B’ hosted Todmorden ‘A’. With the Trades Club hosting most of the best players in the league it was always likely to be a fascinating an exciting evening of chess with plenty of incident to keep the players and the kibitzers happy! Halifax came knowing that only a win could keep their title chances alive while Hebden too knew that failure would see them drop out of the title race. Halifax were slightly weakened by the absence of Bill Somerset but were still able to field a strong side comprising Winston Williams, Darwin Ursal, John Morgan, Richard Porter and Sam Scurfield. Hebden meanwhile were pretty much at full strength with Matthew Parsons, Andy Bak, Chris Bak, Dave Shapland and Pete Leonard all turning out. The early stages of the match looked promising for the visitors as Dave Shapland committed a decisive blunder straight out of the opening against Richard Porter and went down before the players had reached move 20. Then Winston and Matthew agreed a draw fairly early in the evening having both played fairly swiftly to reach a position which was unclear and had plenty of potential play left in it but neither side felt inclined to take any risks. Despite the score line Hebden Bridge seemed to be sitting pretty in the other games and when the next two boards concluded in their favour the match was all but sealed. First Pete Leonard won material against Sam Scurfield and simply hung on to it whilst also building up a decisive positional advantage. Then Andy Bak cashed in on a rare blunder by Darwin who gave away both his d and e pawns in the space of a couple of moves. After that Andy managed to find means to simplify the position so that his opponent had no chance of recovering. Hebden were 2½ – 1½ up by 9.30 and most of the players could now enjoy kibitzing the ‘B’ team’s match with Todmorden. The final game to finish was on board 3 where Chris Bak seemed to have equalized comfortably against John Morgan but then got into difficulties in the middle game and could well have gone down. However, John missed a couple of precise moves and didn’t get the most from his opportunity. Finally Chris managed to simplify down to a rook and pawn ending and the players agreed a draw although some of the strongest players in the room suggested that White could perhaps have continued pressing in the end game with no chances to lose but some hopes of winning. Meanwhile on the next row of tables, Todmorden were being made to work very hard for their result against Hebden Bridge ‘B’ who had one of their strongest line-ups of the season available. With John Allan, Andy Leatherbarrow, Martin Syrett, John Lavan and John Kerrane all playing, it seemed that Hebden would at least give a slightly weakened Todmorden line up of Hamer, Cook, Clarkson, Patrick and Innes a workout. Only the game on board 5 ended swiftly and relatively early as John Kerrane erred against Dave Innes and was dispatched mercilessly. The other four boards however were much tighter affairs and could all have yielded a result of some sort to the Hebden players. On board 4 John Lavan seemed to have made it to a completely equal endgame of rook and pawns against Dave Patrick. However, having worked so hard to maintain the balance John too made a blunder and lost on the spot as Todmmorden took a 2 – 0 lead. The last three games went on deep into the night. Finally though Joh n Allan was ground down in impressive fashion by Martin Hamer on board 1. An English Opening transposed to a Maroczy Bind Sicilian Defence which is notoriously dour for the operator of the Black pieces. Martin created a weakness in the Black camp when John’s b-pawn became isolated. 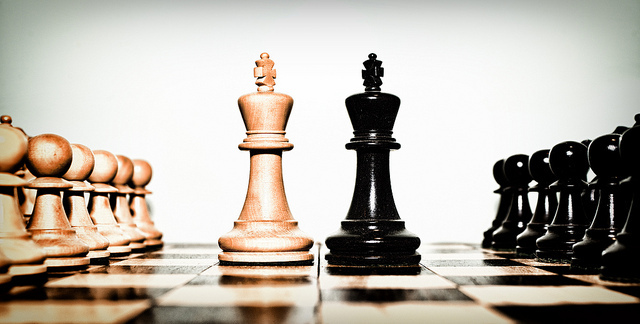 When that pawn eventually fell Martin had connected passed pawns on the a and b-files and after that the result seemed inevitable even if it did take a good while longer to transpire. John fought valiantly but to no avail. Todmorden were over the line with this result. Next to finish was the board 3 game between Andrew Clarkson and Martin Syrett. Andrew has kindly annotated this game for us and it appears in the game viewer at the end of this post. This one didn’t look like it would last long at all as Martin fell into a notoriously dodgy line of the Levenfish Variation of the Sicilian Dragon. With structural weaknesses all over the place it seemed his number would be up but Martin wriggled and fought furiously and Andrew missed a couple of chances to accentuate his advantage. Martin managed to drum up counterplay once the queens had been exchanged and then took advantage of a tactical resource that Andrew had missed to keep himself afloat. The players then entered a rook, bishop, knight and pawns each ending which have a habit if being devilishly complex. This was no exception has Martin seemed to have a dangerous passed e-pawn whilst Andrew took aim at his opponent’s weak king and played for mate. Finally, with the pressure of the clock starting to weigh on both players and the tension in the position getting ever more precarious Martin chose the wrong one of several promising looking variation and Andrew was able to run his king to a safe haven and reinstate his mating threats with decisive effect. Todmorden were somehow 4 – 0 up and had managed to find a way to win three very tight games. But that was nothing compared to the drama that was to conclude the evening on board 2. Andy Leatherbarrow has had a fantastic season, gaining results from a string of much higher rated opponents. He looked like he would repeat the trick against the freshly crowned Calderdale Individual Champion, Phil Cook. This game was a real slow burner with Phil deploying his habitual English Opening. Gradually Andy equalized and that took the initiative but Phil’s position looked solid until, with both players short of time before move 36 was reached he grabbed a hot pawn that him a piece. With time control reached (just!) safely, Andy now had an extra knight and the initiative and Phil’s king looked exposed. But as Andy searched for the most efficient way to finish off his opponent both players drifted into time trouble again. Andy did miss a decisive break through almost at the last but still managed to change up his extra knight to and extra rook. It still looked like a nailed-on consolation win for Hebden but now Andy had almost no time left and as he blitzed out his moves his flag eventually fell with him having traded down to a winning king and pawn ending. Heartbreak then for Andy who certainly deserved more for his good play as both players used pretty much all their time it was not as if he had squandered his allotted time any more than his opponent. There are eight of the ten games played from these matches in the game viewer at the end of this post. With Hebden Bridge ‘A’ having a bye round on Monday night this week, Todmorden finally had the chance to leap frog their rivals by winning their match in hand at Halifax ‘B’. This should have been very straightforward but Todmorden’s line-up was unexpectedly weakened while Halifax ‘B’ were able to field a pretty much full strength side. Peter Hughes, Sam Scurfield and Scott Gornall all managed to draw with their higher rated opponents (Sam indeed almost managing to beat Dave Patrick on board 3), but wins by Andrew Clarkson over Carlos Velosa and Dave Milton over Howard Wood saw Todmorden over the line. This meant that they did indeed finally step into the top spot in the league on 19 points with one round to go. Ominously it’s the first time they have been top of the league on their own this season. Hebden Bridge ‘A’ have 18 points but their board count is much lower than the new leaders meaning that they must beat Belgrave in the final round of fixtures and hope Todmorden slip to defeat against Halifax ‘A’. Not impossible but very much dependent on the strength of Halifax’s team for that match. Speaking of which, Halifax ‘A’ bounced back from the disappointment of losing to Hebden Bridge in round 12 by comfortably defeating a four-man Huddersfield side on Monday night. The visitors scored a full point when Dave Keddie defeated Darwin Ursal, and a half point as Leo Keely drew with Winston Williams on the top two boards but that was their only a consolation. With that result Halifax secure third place with 15. Huddersfield have a bye in the final round of fixtures and so their season is now complete. They lie in fourth place on 13 points. There is still some action to be had at the other end of the league table however. Halifax ‘B’ and Hebden Bridge ‘B’ are separated by just 2 points but Hebden’s cause would have been aided greatly if they could manage to get a result from their tie with Belgrave ‘A’ at the Trades Club on Monday. Sadly, despite having five players and a stronger line up than when they managed to draw with the same team away earlier this season, Hebden got squashed flat this time around. Once more the side played well but were largely undone by blunders which cost them dearly. Only Martin Syrett on board 3 was able to hold a draw with Karim Khan as the home side lost ½ – 4½. Here is the full match scorecard. This result leaves Hebden Bridge ‘B’ bottom on 2 points and Halifax ‘B’ on 4 points. Belgrave are well clear of any relegation battle on 7 points. Hebden play Halifax in the last match of the season and a win would see them draw level on points although their board count is 5 lower than their rivals so they’d need to win 5 – 0 to avoid finishing in last place. This seems unlikely given their recent fortunes but nothing is impossible. The final round of fixtures on the 23rd of April would seem to hold only an outside chance of an upset then as Todmorden have draw odds for the title against Halifax and even that is dependent on Hebden Bridge ‘A’ seeing off a very solid Belgrave line up who have been something of a nemesis for them in recent years. 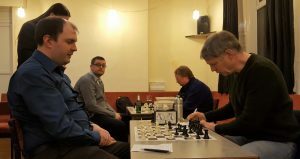 Round 10 of the Calderdale Evening Chess League Division 1 took place this week and the key clash was between league leaders Hebden Bridge ‘A’ and the title holders Todmorden ‘A’. While these two duked it out for pole position in the league the third team in close contention for the title, Halifax ‘A’ took a bye week and were able to watch the results come in with interest. In the first half of the season Hebden had held Todmorden to a draw at home when they all had the Black pieces. Indeed they had very nearly won the match with the champions winning the final game at the end of the night to equalise. Interestingly, on Monday night the sides both fielded identical line ups to the first encounter. Todmorden were at full strength with Messrs Hamer, Mulleady, Cook, Clarkson and Patrick all available. Hebden meanwhile had almost their best line up on paper with only Pete Leonard missing as they fielded Matthew Parsons, Andy and Chris Bak, Dave Shapland and Nick Sykes. Another gripping match was expected with Todmorden three points behind their visitors but with a match in hand. Sadly for Hebden Bridge their night got off to a pretty bad start and they never really got going or even looked like posing their hosts any problems. This Todmorden line up are a very solid side and they don’t lose many games so it’s important not to drop too many boards against them. That Hebden failed to win on a single board was tough enough, that they lost three of the five was particularly disappointing. Proceedings went wrong alarmingly quickly and in surprising fashion when Matthew Parsons made a move order mistake in an opening line he is very familiar with. Ordinarily this might have enabled Martin Hamer to equalise with ease but on this occasion the imprecision cost Matthew and exchange for absolutely no counter play. Martin converted very quickly and smoothly and Hebden were behind almost before they’d got started. Matthew very rarely makes this kind of mistake so it was particularly unfortunate timing for it to happen in this match. Andy Bak seemed to be doing perfectly well against Pete Mulleady’s Dutch Defence on board 2. That was until he gave up a piece for three pawns. It was suggested later that there was nothing wrong with Andy’s concept but perhaps he didn’t follow up as accurately as he needed to for he was forced to resign not too long after the material imbalance appeared on the board. Already the deficit felt like an insurmountable obstacle for the remaining Hebden players to overcome – especially with the extra pressure that comes from being behind and needing to win games. The outcome of two of those three boards became academic when Dave Patrick finished off Nick Sykes on board 5. Nick was particularly unhappy with his play but he too has had a good season for his team thus far with four wins and three draws before this match. In this game he too wasn’t his usual self. With nothing left to play for the remaining two boards were simply a matter of pride for Hebden Bridge. In fact they could well have been white-washed as Andrew Clarkson certainly had winning chances at a key moment in his game with Dave Shapland and Chris Bak was a pawn down against Phil Cook on board 3. The two games couldn’t have been more different however as Chris’s opening experiment against Phil yielded him nothing but a sterile position with no advantage whatsoever. Under such circumstances any mistake at all can be terminal and so he did well to hold on after blundering a pawn. Some accurate defence limited the arrears and Phil knew there was no need to grind it out so quickly settled for a draw. Dave and Andrew’s game have a habit of being tense and complicated encounters with neither player backing away from critical variations. This game was no different and both players have annotated it in the game viewer at the end of the post. For once Dave seemed to get a reasonable position out of the opening against Andrew’s Pirc Defence and certainly held the advantage early in the middle game. However, once his attempts at a direct assault ran out of steam Dave began to lose momentum, Andrew found a clever way to activate his queen and the tables turned. With both players getting into hot water on the clock as well Andrew allowed Dave to sacrifice a knight on d6 in order to get an advance, passed e-pawn. It looked dangerous but Andrew defused it with some precise defensive moves and the game exploded when Dave responded by giving up his queen for a rook and the initiative. The idea was unsound but it needed an engine to prove it and, with both players very short of time Andrew finally made a couple of less accurate moves that enabled Dave to recuperate his materials losses and reach an end game on where both players had a knight and five pawns. At this point Andrew offered a draw and Dave accepted as it seemed that any advantage he might have had was notional and it seemed pointless risking it all for a win when the match was settled already. Also on Monday night, Belgrave ‘A’ suffered a surprising drubbing at the hands of Halifax ‘B’. The visiting side took full advantage of their ‘A’ team not having a match to strengthen their lineup. Never the less a ½ – 4½ defeat was not a likely looking possibility before a piece was moved. Only Gordon Farrar’s draw with Scott Gornall on board 3 saved the hosts from a whitewash as Richard Porter defeated Ian Hunter, Carlos Velosa beat Richard Bowman, Howard Wood took down Angel Gonzalez and Vivienne Webster won against Les Johnson. This signal triumph meant that Halifax ‘B’ over took Hebden Bridge ‘B’ to get onto 4 points. Martin Syrett’s men would now have to win their away match against Huddersfield on Wednesday in order to get back off the bottom of the league table. It was always going to be a tall order for the ‘B’ team and the mountain grew even higher when Martin was once again unable to find five players for the match. The club’s miserable week continued as the four players who did make it suffered a cruel fate at the hands of a resurgent Huddersfield side who should probably have beaten the Hebden ‘A’ team last time out. Only John Kerrane could hold a draw against Dave Tooley on board 3 although of course the other players put up stern resistance, they were all swept aside. Here’s the final scorecard for the Wednesday match. A week to forget and move rapidly on from for both our club’s league 1 teams. Tomorrow is the final round of the Calderdale Individual Championship so hopefully those involved in that can recover some of their morale before the next round of League 1 fixtures on the 20th of March when Hebden Bridge ‘B’ will be taking their bye round and Hebden Bridge ‘A’ will travel to Halifax ‘B’ in a match they simply have to win and convincingly too. Meanwhile Halifax ‘A’ will host Belgrave and Todmorden ‘A’ will host Huddersfield who have thus far been the only team able to beat them this season. The champions will be itching for revenge. Nails were most definitely bitten at The Trades Club on Monday night as Hebden Bridge ‘A’ came very, very close to losing their unbeaten record to Huddersfield. 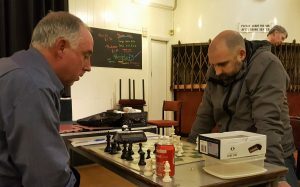 The Calderdale Evening Chess League division 1 title race is really hotting up as, on Monday night, the teams played the ninth of fourteen rounds. We’re at the business end of the season now and the destiny of this year’s title most definitely hangs in the balance. This week title holders Todmorden ‘A’ hosted Belgrave ‘A’, current league leaders Hebden Bridge ‘A’ hosted their old foe Huddersfield and 2013-14 champions Halifax ‘A’ played Hebden Bridge ‘B’ whilst Halifax ‘B’ had a week off. At Todmorden the champions found themselves weakened by the absence of Martin Hamer and Pete Mulleady but they still managed to field a team with an average rating of 165! Replacements Alistair Wright and Mick Connor can hardly be considered as weaknesses. Indeed, both played their part in a tight 3½ – 1½ victory where the home team displayed their resilience by remaining unbeaten on all 5 boards. No small feat with the Black pieces. The top two boards and board 4 were drawn (with Phil Cook drawing with Ian Hunter on top board in what could be a dress rehearsal for the final round of the Calderdale Individual Championship) with wins by Dave Patrick on board 3 over Karim Khan and Mick Connor on board 5 over Mike Barnett proving decisive. Hebden Bridge ‘B’ were due to host Halifax ‘A’ but the fixture was switched to Lee Mount after the corresponding fixture in the first half of the season was played at The Trades Club. Hebden ‘B’ still played with the Black pieces though. Sadly, Hebden were again struggling to put out a full line up and defaulted board 5 but the remaining four players put up a terrific fight. Andy Leatherbarrow has been having a golden season (he’s only lost one game so far) and he put in another legendary performance to take Darwin Ursal’s scalp on board 1 (the rating list shows a whopping 58 point difference between the two though we all know what Andy is capable of) while captain Martin Syrett held Winston Williams to a draw on board 2 (overcoming a 47 point rating difference). On paper the juiciest tie of the round always looked like being Hebden Bridge ‘A’ against Huddersfield. These old enemies have played out plenty of epic battles over the years although in more recent times Hebden have had the edge – in fact the last time Huddersfield won was on 22nd September 2014. Perhaps it was their time to win again. Both teams fielded slightly unusual line ups. Hebden were missing the services of Matthew Parsons and Pete Leonard but drafted in Chris Bak and John Allan as replacements alongside Andy Bak, Dave Shapland and Nick Sykes. Huddersfield meanwhile were without regulars Greg Eagleton, Mitchell Burke and Dave Tooley but they still brought a competitive side with Leo Keely and Dave Keddie on boards 1 and 2 and Steve Westmoreland, Robert Sutcliffe and Bryn Charlesworth completing their line up. On paper Hebden looked much stronger on the lower boards with the top two boards looking more closely matched. Of course what looks likely from an analysis of the statistics before the match often bears no relation to what actually takes place. This match turned into an epic struggle with all five games ending decisively. Right from the off the outcome looked in the balance as two of the five boards were decided relatively quickly. First of all Andy Bak had a bad day at the office against Leo as his double edged opening choice of the Schliemann Variation of the Spanish backfired. He first lost the exchange for a pawn and then blundered into a pawn fork that lost a piece. All this compelled his resignation before the players had reached the 20th move. A game to forget for Andy. Hebden bounced back quickly though as John Allan made fairly short work of Steve Westmoreland. The Tarrasch Variation is not a popular choice against the Queen’s Gambit these days and Steve, who is normally very well prepared in the opening phase of the game, seemed to be caught a little bit cold. He lost a piece in the opening and after that John offered him no hope of recovering as he simply exchanged material and achieved an overwhelming advantage in the end game. 1 – 1. Somewhat later on Nick Sykes made it 2 – 1 to the hosts as he converted smoothly against Bryn Charlesworth on board 5. It was a solid performance from Nick who has only lost three of his seventeen games this season. 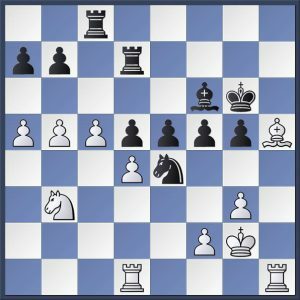 He met Bryn’s offbeat choice of the Nimzo-Larsen opening in principled fashion and slowly outplayed his lower rated opponent winning an exchange and then grinding out a win. Hebden were in front but the remaining two games looked very worrying indeed for them by the time Nick had put them in front. On board 2 Dave Keddie and Chris Bak were playing a Classical Variation of the French Defence and it appeared that Chris had chosen a fairly unusual approach. In the middle game he overlooked a tactic that cost him a pawn and Dave found a clever way to maintain a passed pawn on f6. Chris was hanging on but White was clearly better. Meanwhile on board 4 Dave Shapland had reintroduced the Budapest Counter Gambit to his repertoire against Robert Sutcliffe. The opening seemed to be going according to plan for Dave until it became clear that Robert was going to break with orthodoxy by castling queen’s side. This was a smart move because Dave burned way too much time on his clock trying to find a way to take advantage of Robert’s choice but in the end couldn’t find any way to improve on Black’s regular plan and the game took a fairly obscure turn. Later on Dave missed a move order trick that enabled Robert to set up a various dangerous looking battery of two bishop and a queen pointing towards Dave’s castled king. Robert then played very energetically to advance his king’s side pawns in order to break open that side of the board and it was clear that White’s attack was going to be the fastest. Dave sought refuge in complications but was now extremely short of time and in trouble on the board as well. Black (Chris Bak) has just played 30…Kd6 to try and protect his e-pawn. Can you see how Dave Keddie responded? The solution is in the game viewer below. As both these remaining games reached their critical phases Hebden Bridge seemed in deep trouble but, as so often happens in these tense situations, mistakes changed the course of events. On board 2 Chris, desperately trying to prevent the advance of Dave’s f-pawn fell victim to a very attractive tactic that would have a decisive material cost. Chris chose a different path and went for a walk up the board with his king only to be caught in a mating net. It was 2 – 2. The final act of the evening was no less dramatic as Robert and Dave approached time control with Dave down to his last minute on the clock. Suddenly Robert started playing quickly too although he had more time to think. A forcing line appeared in which it looked like Robert could grab a pawn and open up Dave’s king to a decisive attack. However, he’d missed an intermezzo from Dave’s queen which cost him the bishop and the game was suddenly over. You can find a number of the games played on Monday night in the game viewer at the end of this post. These results mean it’s ‘as you were’ in the league table. Hebden Bridge ‘A’ stay top on 14 points. Halifax ‘A’ are second on 12 and Todmorden ‘A’ are third with 11 although they have a match in hand on the other two which could bring them within a point of the leaders. Huddersfield have 9 points and now seem to be out of contention for the title although with Todmorden and Halifax still to play, they could yet have a bearing on the outcome. At the other end of the table Belgrave ‘A’, despite running a number of the top teams very close have only 4 points and are not clear of the relegation dog fight as Hebden Bridge ‘B’ and Halifax ‘B’ are both on 2 points. It seems likely that the games between these three teams will decide which one of them goes down. In the next round of fixtures on 27 February Hebden Bridge ‘A’ will travel to Todmorden ‘A’ for an absolutely critical encounter. Hebden have yet to lose a match but they have drawn two, one of these was against Tod. It should be enthralling especially if both teams are able to field their strongest line ups. Halifax ‘A’ have a week off and so you can imagine they too will be fascinated to see the outcome of his tie. While this is going on Belgrave ‘A’ will play host to Halifax ‘B’ in the relegation battle of critical import. If Belgrave win you’d have to fancy that they wold guarantee their safety. The final match sees Hebden Bridge ‘B’ on the road again at Huddersfield. The Trades Club also saw another one of the inaugural Handicap League fixtures as Hebden Bridge played host to Belgrave while at Todmorden another match was played between Todmorden and Halifax. The final round of fixtures is due to be played on the 10th of April and there is a postponed match between Belgrave and Todmorden to be re-scheduled. At Todmorden the home team put out the stronger side but as a result gave their opponents a 3½ point head start. They did manage to overcome this with a 5 – 1 ‘over-the-board’ score to take the match 5 – 4½. At Hebden Bridge John Kerrane took the opportunity to field an all-junior line up against the visiting Belgrave side. What’s more, as the visitors came with only five players, he was even able to add a further player (Martha Leggett) to their team in order to make sure everyone got a game. This is really what the handicap league is all about, giving League 2 players more opportunity to play games and for the juniors, every game is great experience. When the handicap (average rating difference between the two teams) was calculated Hebden also started with 3½ points but they too were overhauled by their more experienced opponents. Only the ‘enemy in the midst’ of Belgrave’s ranks lost her game as the visitors match Todmorden with 5 – 1 win at the boards and a 5½ – 4½ win over all. Below are the individual scores for the match. The outcome of this league is also completely up for grabs with Halifax, Belgrave and Todmorden all in the hunt. After a Christmas vacation of over a month, Calderdale League 1 teams re-convened this week to begin the second half of the season. With Hebden Bridge ‘A’ just a point in front of title holders Todmorden ‘A’ and two points ahead of Halifax ‘A’ this year’s title race is once again set to be enthralling. In fact, before we dive into the eight round of fixtures lets round up the only loose end from the first half of the season as Halifax ‘B’ hosted Huddersfield on the 16th of January to play the match that was postponed in November. The visitors white-washed their opponents in convincing fashion which meant they also closed to within two points of the league leaders at the half-way point of the season. Traditionally, fixtures between teams from the same club take place in the first and eight rounds in order to eliminate any possibility of collusion for a ‘convenient’ result later in the season. That said, sometimes clubs seem to find it strangely more difficult to get ten players out than they do during the rest of the season. Thankfully, that didn’t happen on this occasion as full line-ups were fielded for both the Halifax and Hebden Bridge derbies. We should have seen a Todmorden derby as well but Todmorden ‘B’ withdrew before a pawn was moved this season and so Todmorden ‘A’ had a bye round which will have suited them with their board 1 player Martin Hamer currently playing in the Gibraltar Open. Indeed, players absent in Gibraltar certainly had an impact on Huddersfield’s match at Belgrave this week. 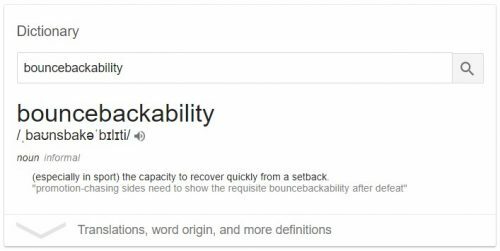 Both Greg Eagleton and Mitchell Burke are over at the rock and that meant Huddersfield had to put out a weaker team than Captain Steve Westmoreland might have liked. Even more unfortunately, Belgrave chose this week to put out their strongest side of the season with regulars Ian Hunter, Karim Khan and Gordon Farrar supplemented by rare appearances from Richard Bowman and Malcolm Corbett. This meant Gordon played on board 5 which is most unusual. As it happened strengthening the lower boards didn’t help the home side in that department as Khan and Corbett lost to Nigel Hepworth and Steve Westmoreland respectively and Farrar drew with McFadden on board 5. This might have cost Belgrave dearly but they salvaged a point from the match as Hunter beat Keddie on board 1 and Bowman beat Tooley on board 2. 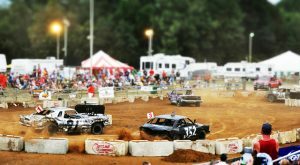 Now to the ‘demolition derbies’ alluded to in the title of this post. Halifax ‘A’ put their ‘B’ team to the sword most convincingly. Only Peter Hughes on board 1 salvaged a draw with Winston Williams. Beyond that there were wins for Messrs Ursal, Somerset, Morgan and Porter who all out-rated their opponents by 40 points or more! Finally, we come to the Hebden Bridge derby which the ‘A’ team approached with some degree of trepidation. After all, on the first evening of the season they had been lucky to escape with a draw when Andy Leatherbarrow and Martin Syrett had surprised Dave Shapland and Chris Bak respectively and John Allan had held Matthew Parsons to a draw. On this occasion both sides were slightly weaker. Hebden ‘A’ field just one of the two Bak brothers – Chris – and consequently Hebden ‘B’ did not have Nick Sykes amongst their number as he took his regular seat on board 5 for the ‘A’s. There was still a question about whether the players might have become a bit rusty over the Christmas period having only had the third round of the Calderdale Individual and in some cases, the Yorkshire League, to get their brains back into gear this month. In fact, the most significant factor in this match turned to be the colour allocation for, as the ‘away’ team in this match, Hebden ‘A’ took the White pieces on all boards and made full use of them. First to finish were Pete Leonard and John Kerrane on board 4. Pete actually blundered a pawn and allowed the queens to be exchanged in the same combination on move 10 but never the less seemed to obtain a reasonably active position by way of compensation. Five moves later John overlooked a tactic that allowed Pete to gain two pieces for a rook and suddenly the game had turned around. Pete played actively after that and sealed a win as early as the 26th move to take his personally tally in the League to 4½/5. The ‘A’ team asserted their superiority further when Nick Sykes took down Neil Bamford’s Sicilian Dragon to double the lead. Like Pete, Nick is also undefeated in the Calderdale League this season. In fact his only defeat since September came at the hands of Phil Cook in the last round of the Calderdale Individual Championship. It is on such individual records as these that Hebden are building their title challenge. On board 1 Matthew Parsons was facing John Allan for the third time this season. They had drawn in the reverse fixture when Matthew had Black and John had played very accurately to hold him to a draw. Then they had played again with the same colours early this month in the Individual when Matthew played superbly to nurse a small advantage to victory. Now Matthew had White and it was evident right from the off that he was determined to make it count. Playing his habitual London System he methodically outplayed John using his formidable understanding of the opening to ruthlessly exploit every inaccuracy. 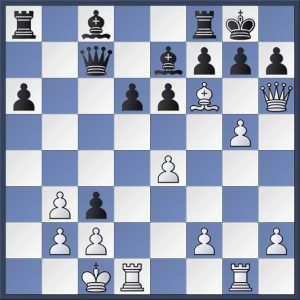 Finally, John cracked under the pressure as he blundered his queen and resigned immediately – oddly enough also on move 26. Matthew has provided some notes to this game which is published along with the others from this match in the game viewer at the end of this post. This result took the ‘A’ team over the top and on to 3 points. Now it was just a matter of how many points they could score to improve their board count. The last two games were repeats (but with colours reversed) of the match-ups that had upset the apple cart in round 1. Chris Bak against Martin Syrett on board 2 and Dave Shapland against Andy Leatherbarrow on board 3. The two games were very different in nature with one being sharp and tactical in nature and the other much quieter and positional. For the second game in a row Dave faced the Two Knights and employed the so called ‘Modern variation’ where White plays 5.e5 instead of 5.0-0 which has a long history. For the second game in a row his opponent chose immediately to take a solid and relatively unambitious path. In round 3 of the Calderdale Individual Richard ‘Beaky’ Bedford had chosen 5…Ng4 and gone on to achieve a superior position. Now Andy took a leaf out of this book by employing 5…Ne4. Dave responded by offering a pawn sacrifice on move 7 which Andy declined in order to try and create disharmony in the White camp. It seemed to work as he equalised easily. Dave tried to keep tension in the position but Andy found a way to get the queens off and then simplify down to an opposite coloured bishops ending. Try as he might to exploit a purely notional positional advantage, Dave couldn’t provoke Andy to make a mistake and eventually the game was agreed a draw. With that Dave’s winning streak of eight games comes to an end and Andy continues his admirable renaissance after having a tough year in 2015-16. The second chapter of Bak vs. Syrett was a complicated and tense affair in which both players managed to get into zeitnot twice and the outcome seemed in the balance right up until almost the very end of the evening. Martin continues to eschew his old Scandinavian habit in favour of the Sicilian Defence. Chris played an offbeat closed line and seemed to get a solid advantage but as always, Martin wriggled and resourcefully found ways to stir up trouble. In fact kibitzers noticed that Chris appeared to overstep the time limit right before move 36 but Martin, in acute time trouble himself, didn’t notice. It was ironic then that the game was finally decided when Martin overstepped the time limit much later in the evening although by that stage it appeared that his position was hopeless in any case. These results ensure that Hebden ‘A’ stay top of the league two points clear of Halifax ‘A’ and three clear of Huddersfield and Todmorden ‘A’ who have a game in hand. Their next couple of matches are likely to be absolutely crucial to their title challenge however as they face first the erratic but ever-dangerous Huddersfield at home and then the reigning champions Todmorden away. If they can win both of those two tough encounters they’ll be in the box seat. Monday night also saw the inauguration of the Calderdale Handicap League which was created primarily to offer league 2 players a few more games during the season. Only three clubs – Hebden Bridge, Halifax and Belgrave – have entered teams, but it will an interesting experiment that could gather more momentum in future seasons especially if the league’s team numbers continue to dwindle. So, on Monday the Trades Club saw Hebden Bridge host Halifax although Halifax should have been the home team but generously agreed to play in Hebden Bridge as the home side fielded a squad full of juniors meaning travel would have been very difficult. The handicap systemis based on average rating of the two sides with a weighting being awarded to the lower rated team in the form of points on the scoresheet ahead of the match. In this instance the Hebden Bridge started the tie on 1½ points. All five games from the Hebden Bridge derby can be replayed in the game viewer below. 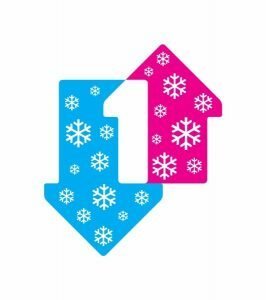 Who is Christmas number 1? Two rounds of fixtures have been held last week and this so there is plenty for us to catch up on before we settle down to our turkey and brussel sprouts. Then last Monday came the sixth round of fixtures. Top spot holders Hebden Bridge ‘A’ had a bye for this round but kept vigil over the pack of teams arranged closely behind them in the table. First up the champions benefitted from a walkover as Halifax ‘B’ defaulted their away trip to Tod ‘A’ for the second successive season. I’m sure that Todmorden would have much preferred to play this match than have 5-0 handed to them and if the title hunt comes down to board count this results could yet be a factor in the outcome. Meanwhile title contenders Halifax ‘A’ and Huddersfield were scrapping it out at Huddersfield for the right for second place in the table. Halifax won it in a gory match where all boards ended decisively. Winston Williams, Bill Somerset and John Morgan all won their games on boards 2,3 and 4 respectively but on board 1 Darwin Ursal lost to Greg Eagleton and on board 5 Richard Porter lost to Steve Westmoreland. This result meant that Halifax took second place on the same points but a lower board count than Hebden Bridge. Huddersfield meanwhile having played all three of their closest rivals with the Black pieces in the first half of the season found they had lost to Hebden Bridge ‘A’ and Halifax ‘A’ but beaten Todmorden ‘A’. They have a postponed match in hand against Halifax ‘B’ and if they won that they’ll get to 8 points and remain in contention for the title. Finally, Belgrave hosted a Hebden Bridge ‘B’ side who were once again a player short. Despite having a decent pool of players Martin is struggling to find enough of them who are available for each match and this was compounded last Monday by the lack of a driver to get the players to Halifax. With the ‘A’ team having a bye, Nick Sykes was able to ease the situation by appearing on board 1, but the rest of the team had to get to the venue by public transport and taxis. Finally then we come to this week’s seventh round fixtures. The choice match up was undoubtedly Todmorden ‘A’s trip to Halifax ‘A’ in a clash that would decide who would go top of the league should Hebden Bridge fail to beat Belgrave at home. Todmorden had already enjoyed having the White pieces on all boards against Hebden Bridge ‘A’ and Huddersfield this season but had only managed a single point with their draw at Hebden. They really needed a win to keep them in contention in 2017 when they will have to play Black against these three rivals. Todmorden took a commanding lead in the match as Martin Hamer (playing on board 2 possibly for the first time ever!) beat Bill Somerset and Dave Patrick beat Carlos Velosa on board 5. They then secured the match win with draws on boards 3 and 4. Pete Mulleady on board 1 looked like he would round off a commanding performance as he had the better position against Winston Williams. However, at the end of the evening’s play and no doubt in time trouble, he stumbled to defeat and Halifax succeeded in taking some of the gloss off the score line which finished 3 – 2. Hebden Bridge ‘B’ were due to play Halifax ‘B’ at the same venue but a series of calamities forced them to default the entire match at the last moment. Once again Martin Syrett was struggling to find available players. He had again scraped four together but then John Kerrane came down with the lurgy on the day and had to withdraw. Once again without transport for an away match and with only three players, Martin decided to concede defeat and so Halifax found out what it feels like to have a match default. Not ideal. Finally, Hebden Bridge ‘A’ played host to Belgrave ‘A’ knowing that a win would ensure they at least shared top spot. In fact with the result at Halifax turning out in their favour it transpired that a win would put them top on their own – though of course they didn’t know that during play. Belgrave put out their regular line up of Ian Hunter, Karim Khan, Gordon Farrar, Mike Barnett and Angel Gonzalez. Les Johnson turned up as well but when offered the chance to play on board 5 he deferred to Angel. Hebden meanwhile were without their strongest player, Matthew Parsons, but were still able to field a line-up that looked strong enough on paper to secure victory, especially on the lower boards, in the form of Andy Bak, Chris Bak, Dave Shapland, Pete Leonard and Nick Sykes. In the event, although Belgrave battled hard, Hebden took control early in the evening and managed to keep their noses in front. First of all Nick Sykes benefitted from a blunder by Angel in the opening. He simply left a piece en prise. Next Chris Bak agreed to a draw against Karim Khan on board 2. After an unusual line of the French Defence appeared on the board the queens came off on move 8 and thereafter the game simplified further. Neither side took any chances and, at move 18, with two rooks, two bishops and six pawns each on the board, the players shook hands. A little while later, Dave Shapland managed to continue his winning streak in Yorkshire competitions against Gordon Farrar who elected to play the rarely seen Belgrade Gambit of the Four Knights. Dave played cautiously to begin with but managed to secure the extra pawn and then found some energetic continuations to push forwards in the centre. The game got complicated towards the end but Dave seemed to have everything under control and bagged the win when Gordon blundered into a mate. Hebden had now secured at least a tied match but on the last two boards matter were not straight forward. On board 1 Andy Bak secured what looked like a clear advantage against Ian Hunter in a sideline of the infamously complicated Botvinnik Variation of the Semi-Slav. However, as is often the case with these types of openings, one slip is fatal and so it proved as Andy over looked a zwischenzug that caused him to lose a rook. With blunders having decided all three decisive games thus far it now fell to Pete Leonard (hero of the hour at Halifax in November) to avoid making another one to hold what looked like a tricky ending against Mike Barnett on board 4. Indeed, it appears that Mike missed some good winning chances as time pressure built up before they reached move 36. It looked like the main danger Pete might have would be to take a risk playing for a win when a draw was all that was needed. However, in the event it looks like he too missed a couple of winning tries just before time control. You can find all five games from this match, plus Nick Sykes’ draw with Ian Hunter from the Hebden ‘B’ match with Belgrave, in the game viewer below. So at the halfway mark this season, Hebden Bridge ‘A’ have 10 points and are the only unbeaten team in the league. Todmorden ‘A’ are just behind them on 9. Halifax ‘A’ have 8 and will be joined on that score by Huddersfield assuiming they win their match in hand against Halifax ‘B’. It’s very much game on at the top then with all four of these teams still in genuine contention. We’ll have a much better idea about Hebden’s chances of taking the title at the end of February when they will have played both Huddersfield and Todmorden again. At the bottom, Belgrave have 3 points and Hebden Bridge ‘B’ and Halifax ‘B’ both have 2. Here too then, there is still a great deal to be decided in the relegation battle. All that remains is for us to wish all our members and visitors a very happy Christmas and a health, prosperous and check mate filled 2017! Pete Leonard (left) was made to work extremely hard for his decisive win against John Morgan on board 4. Two of the three scheduled Calderdale League 1 fixtures were postponed on Monday night as away-players had difficulties getting to venues amidst the travel chaos caused by the miserable stormy weather. Hebden Bridge ‘B’ were unable to get to Todmorden for their match with the league champions (although the largely Lancashire-based Todmorden team was able to get there) and Huddersfield were also forced to abandon their trip to Halifax ‘B’. There will be plenty of time to re-arrange these fixtures later in the season. That just leaves us with one match to report on. Thankfully it was an absolute stonker as Hebden Bridge ‘A’ travelled to league leaders Halifax ‘A’. With Halifax having deployed their strongest possible line up in the previous round of fixtures against Belgrave, Hebden were expecting a very warm reception and when it became clear that the home team would be only slightly weaker than they were for the Belgrave match (Carlos Velosa replacing Richard Porter on the bottom board) it was clear that they were going to get one! Hebden themselves had the spine of their team all present and correct. Matthew Parsons, Dave Shapland, Pete Leonard and Nick Sykes are all in good form at present and they were joined on this occasion by just one of the two Bak brothers as Andy made his fourth appearance of the season. Despite having such a strong line-up themselves, Hebden were out-graded on all but the top and bottom boards and therefore expected a very tough struggle although having the White pieces would certainly be of assistance. A tough struggle was exactly what they got although three of the five games were over by 9.30 which is quite an unusual occurrence for such a heavy weight clash. This was no reflection on the level of aggression on display however as two of those three games ended decisively. The final position from the game between Dave Shapland and Bill Somerset deserves a picture. Bill had overlooked White’s winning move 18.Qh6! On board 3, Dave Shapland was up against Bill Somerset and took the opportunity to deploy the highly complicated Velimirovic Attack against Bill’s Classical Sicilian set up. Dave correctly anticipated that Bill would not shirk a theoretical discussion and saw the game develop as he expected it to right up to move 11 when Bill chose to divert from the mainline and the players were no longer playing from their re-collection of the opening books. The game still developed in highly complex fashion with Dave offering a piece sacrifice on move 15. By move 18 it emerged that Bill had overlooked a key idea in the position and was getting check-mated. As always with such complicated games, chess software subsequently found numerous ways to improve for both players, but on this occasion it was Bill who made the decisive error. At about the same time that this game was concluding, so did the game on board 5 between Nick Sykes and Carlos Velosa also finished. Carlos surprised Nick by not playing his habitual choice of 1…b6. Instead he played classically and the players soon reached a Berlin Variation of the Ruy Lopez. Of course this opening has the reputation of being pretty stodgey at the highest levels of the game but Nick kept tension in the position early on and the game developed in an open and tactical manner. 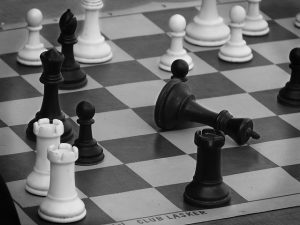 In this instance the tactics heralded simplification rather than a decisive advantage and the players soon decided to conclude a peace agreement. With the two team Captains (Carlos and Dave) now having finished their games, they were completely available to fret and worry over the remaining results. Halifax levelled the match very soon after board 5 was finished as Andy Bak, who had earlier appeared to have a promising position and an extra pawn against Winston Williams, made a tactical miscalculation and found himself on the end of a decisive attack. The match was all square with two games to finish. Two of the highest rated players in the league (Darwin Ursal and Matthew Parsons) produced a suitably tense and gripping battle. On board 1 Matthew Parsons and Darwin Ursal were locked in an epic struggle. These are two of the biggest beasts in the Calderdale League and their encounter was suitably hard fought and tense. Matthew took no chances and essayed his favorite London System and Darwin did his best to take the game down an offbeat path in the face of Matthew’s comprehensive understanding of all the key Black responses. Ultimately, both players burned significant amounts of time with the position on the board remaining tense. Finally, Darwin either made a mistake or took a very risky decision and both gave up a pawn and damaged his structure at the same time in the hopes of activating his pieces. With only a handful of seconds left on their clocks to reach time control both players overlooked some tactical points that they would normally have spotted and when they reached the haven of move 36, with material and chances even, they immediately agreed a draw. All the kibitzers breathed a sigh of relief and then pointed out both the player’s zeitnot oversights. Don’t they always! This just left board 4 to finish with the match all square. 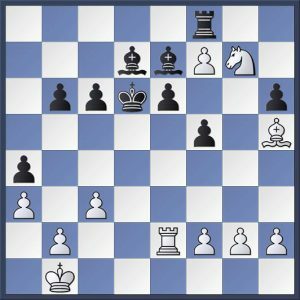 In contrast to his Captain on board 5, John had chosen to return to an offbeat old favorite of his (1…a6) rather than play the Pirc which has recently appeared more frequently in his repertoire. This time it was Pete who took the game off down an interesting avenue early on as he won a pawn but at the cost of allowing John to activate his pieces and especially his queen’s bishop on h1-a8 diagonal. Soon Pete had to give the pawn back though and as the queens came off the board the tables were turned as Pete got a very active position in exchange for two pawns. It turned out that the second pawn John grabbed was poisoned and, as a result, Pete was able to trap the remaining Black knight. In the final phase of the game, as both players started to get into time trouble the material on the board was two bishops and two pawns for White versus one bishop and five pawns for Black. Pete’s bishop pair were dominant though and by the time the players had scraped through to time control John only had one extra pawn and it was unable to progress up the board. The only question that now remained was whether Pete could find the right method to win and avoid any drawing tricks john might have in the time he had remaining. Slowly, agonizingly slowly for the involved kibitzers, Pete edged his way towards victory until, when both players were down to their last few minutes John shook the dice for a final time as he swapped off his bishop for Pete’s last pawn and asked his opponent if he knew how to check mate with the bishop pair and a king. With only a couple of minutes on your clock and the match result in the balance this is quite a tall order but, finally, Pete did manage it. His relieved and happy team mates congratulated him as Hebden secured a critical victory. Here are the individual results for the match. The annotated games can be found at the foot of this post in the game viewer. There are some good ones this week to be sure! The battle for the Calderdale League 1 title just got very hot this week as Halifax ‘A’, Hebden Bridge ‘A’ and Huddersfield all presented their credentials persuasively while back-to-back champions Todmorden ‘A’ slumped to a defeat. Let’s start with that last headline as, on Wednesday evening Huddersfield took on Todmorden at home and managed to go one better than Hebden Bridge ‘A’ had done when they drew their match with the champions in the last round of fixtures. This was a blood-soaked match with all five games ending decisively. Tod took boards 4 and 5 as Dave Patrick defeated Dave Tooley and Mick Connor beat Steve Westmoreland. In most circumstances one might have expected that to be more than sufficient for Todmorden to take the match as their top boards are always very reliable, especially with White. However on this occasion they suffered a major malfunction. On board 1 Martin Hamer went down to Greg Eagleton, on board 2 Mitchell Burke beat Phil Cook and on board 3 Dave Keddie overcame Andrew Clarkson as Huddersfield snatched the match 3-2 and sent the champions home with their tails between their legs. Earlier in the week Halifax ‘A’ gave the clearest possible signal of their intent to win back the title they lost to Todmorden two seasons ago as they fielded their strongest possible line up for the first time this season. This was more than sufficient to brush aside Belgrave ‘A’ although it wasn’t all plain sailing for the visitors as they drew on board 1 and lost on board 3. With more than 30 points rating advantage on the bottom four boards Halifax would have expected to win the match comfortably but on board 3 Gordon Farrar took down Bill Somerset while the battle between Ian Hunter and Winston Williams on board 1 looked on paper like it might be tight and it did indeed end in a draw. Nevertheless wins for Halifax by Darwin Ursal (playing his first match of the season) against Karim Khan on board 2, John Morgan (also making his first appearance of the season) against Mike Barnett on board 4 and Richard Porter against Angel Gonzalez on board 5 secured victory and means Halifax are now the only remaining team with a perfect record in the league after winning three out of three. That just leaves us to report on Hebden Bridge ‘A’s home match against Halifax ‘B’. With their ‘B’ team having a bye in round 4, Hebden took something of a chance by leaving out their three highest rated players and replacing them with B-team stalwarts to take on the back markers. This was certainly a risk as they lost with the Black pieces when deploying similar match tactics against the same side last season and certainly couldn’t take victory for granted. However, even without Matthew Parsons, Andy Bak and Chris Bak, they overwhelmed the visiting team. Objectively speaking Hebden still looked like firm favorites as they out-graded the enemy by 10 points or more on the bottom three boards. The top two boards were also stronger than their counter-parts, though to a more marginal extent. It felt like it was going to be a tough night but, in the event, Hebden pulled two clear fairly early in the evening with a couple of quick wins and never looked back. First of all, Nick Sykes equalized comfortably against Scott Gornall’s patient opening play on board 3, and then won a piece when Scott left a bishop en prise on move 14 having moved its defender the previous move and evidently ‘forgotten’ he had done so. An embarrassing moment to be sure, but we’ve all done it at some point. Not too long after that Dave Shapland accepted a resignation from Pete Hughes on move 19. Dave deployed the aggressive Albin Counter-Gambit and it seemed that Pete may have been over ambitious in pushing his queen’s side pawns before getting his king to safety. Suddenly Dave overwhelmed him on the dark squares, won the exchange and a pawn whilst preventing Pete’s king from castling. The position was grim enough to persuade Pete to resign at once rather the be tortured in a drawn out ending with this type of material deficit. Hebden were 2-0 up. Martin Syrett usually captains the ‘B’ team but with his side enjoying a bye week he took to board 4 against Vivienne Webster and surprised spectators by playing the Sicilian Defence instead of his habitual Scandinavian. He seemed to get a reasonable position in the middle game but Vivienne played patiently and preserved a small edge until the players reached a queen and pawn ending and Vivienne swiped an extra pawn. Unfortunately she overlooked a stronger continuation and allowed Martin enough counter play to force a perpetual check. Hebden just needed a draw from the last two boards to win the match. 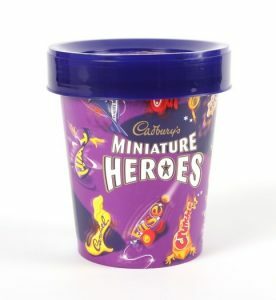 They did rather better than that! First Andy Leatherbarrow profited from some more Halifax charity when he pounced on a tactical oversight by Ray Cully to win a piece. Ray didn’t need to see any more and resigned on the spot as Hebden crossed the finish line with a game to spare. That game too finished in a victory for the hosts as Pete Leonard slowly improved his position after being at a disadvantage against Carlos Velosa in the opening stages on board 2. With the position looking complex but balanced Carlos sought out complications and found a way to ‘win’ Pete’s queen for two knights and a rook. Such material imbalances can be tricky to manage but Pete seemed to keep everything under control and soon managed to restrict Carlos’s queen to such an extent that he saw nothing better than to give her majesty up for Pete’s rook and trying to race a passed pawn to the eight rank. Pete navigated the final complications and forced resignation capping a very fine performance from Hebden. The games from this match can be found in the game viewer below. Next Monday sees the Calderdale Individual Championship getting underway. Once again the Trades Club will host the competition with rounds being scheduled for the 7th of November, 5th of December, 9th of January, 6th of February and 6th of March. There is still time for you to enter if you haven’t already. Further details can be found on the Calderdale Chess League website. Please email or call John Kerrane to confirm your entry by no later than Sunday 6th of November.